With all the publicity about Apple rejecting Google Voice iPhone app I just had to install it on my HTC G1 to check what the noise is all about. First of all to use the app you need to have a Google Voice account. It is offered by invitation only and to get it you need to fill out this form and wait for an invite code to show up in your email box in a few days. You are more lucky if you have a GrandCentral account. Since the company is now owned by Google you can convert your account to Google Voice and this way get access to the app. The upgrade took me just a few moments and it kept my old contacts and call settings. The new service has all the cool features that GrandCentral had plus more: voice mail transcripts, conference calling and SMS support. No one sends me SMS messages and I am yet to try conference calling but I find voice mail transcripts a great time saver. Here is how a typical voice mail transcript looks. The only bits that have errors are the last name and the phone number (it somehow got an extra digit which should not be there). The release of Google Voice Android app has made the service even more useful since now I can not only receive calls to my Google Voice number but also make them and the receiving part will see my GV number despite the fact that I call from my cell phone which has a different native number. The app nicely integrates with the Android contact book and you can configure it to intercept all calls, only international calls, or prompt on each call you make. 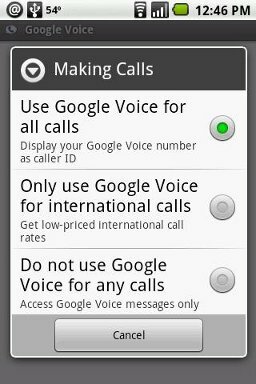 So far I have configured it for international calls since the rates are much lower than what t-Mobile offers but I will be glad to go all the way with the first option if/when Google offers to port my cell number to Google Voice. Too many people have it and it will be too much of a hassle to migrate. Meantime I can still use the GV number as a temporary number I want to give to the businesses and people whose calls I want to screen. E.g. I am going to give it to the car dealers when I go shopping for a new car to replace my Accord which later this year will have 160K miles on the odometer. By the way, I find GV international calling rates very competitive. Canada is free, Ukraine is 10 cents and Russia is 5 cents (these are the 3 countries I call the most). JustVOIP is still cheaper but it is hard to compete with the Google Voice convenience so most likely I will use it when I have to call on the go (which previously was a big hassle since I had to dial all those access codes). Paypal is the winner for occasional payments. If you send money to mostly the same people then you should consider Obopay because of the low fees. International transfers - give Xoom a try and only use MoneyGram if Xoom doesn’t send money to the country you need. Not often these days a new shopping startup comes around that gets me excited. Modista looked cool but was not very useful. ShopSavvy was useful but I only used it so much - my shopping is mostly online. BeatThat had a cool idea but implementation fell short - too few products. All these services offered something novel but they all lacked the scale. Alice.com is a new startup launched by the same folks who sold Jellyfish to Microsoft in 2007 and pocketed $50 mln, and it really promises to be something big. On the outside Alice is a neatly built shopping site to buy household essentials with thousands of names in stock and free shipping on everything. On the inside, Alice is an open platform for manufacturers to sell the kind of products they want at the prices they set, the first of a kind from what I know. The shopping part of the site is very clean. Products are presented in a nice grid view, each one is provided with an image, details, and even price comparison. Some items come in several packaging sizes and if they do you can easily cross reference them. The overall interface reminded me of Endless.com, the shoe store by Amazon. It is very clean and very nicely organized. As you add items to your cart you can also add them to your list of things to buy regularly and select the refill frequency. Alice will then send you a reminder when you are about to run out of toilet paper, toothpaste, or whatever else you added to your list. As I already mentioned, shipping is free on all orders, something a bargain hunter will certainly appreciate. The closest competitor to Alice is probably Amazon, and I have to admit Alice stands favorably so far. Even though Amazon offers a greater variety of brands, Alice has the most popular ones covered and the package size assortment is much better. Amazon typically forces you to buy large amounts while with Alice you get same package size you will typically find in your local grocery store. On top of the typical shopping functionality Alice offers some bells and whistles like Budgeting (these are in essence your monthly expense stats by product category) and Neighborhood (a basic set of social tools like friends, profiles, chat, walls, etc). There is not much going on yet in the Neighborhood except for the chat area which is dominated by the former JellyFish members some of whom have ported their screen names to Alice. We’ve created a platform that allows the major CPG manufacturers to actually become the retailer and sell directly to the consumer,” Mr. Wiegand said. “Retailers increasingly have become manufacturers. So the next logical step is for manufacturers to become retailers. I am eager to see if the idea stands and if Alice grows enough to successfully compete with the traditional players and to become profitable. According to this Reuters post, the startup makes money off of manufacturers “by giving the companies spending data, advertising space and distributing samples for them to targeted customers”. My understanding is that with the traditional model the store makes money via price markup and so the revenue comes from the consumers. Will this new model bring shoppers lower prices and better service? It is hard to say. Initially the answer is definite yes since everyone including the manufacturers is vested into the success of this enterprise and are willing to sacrifice some of the revenue in exchange for great initial impression. What will drive prices down later on? It could be the transparency that Alice built into the platform, or it could be the volume (if the site really takes off). Whether Alice.com is successful or not, I already feel it is promising to be a very interesting experiment! Do I really need $24.99/mo home phone service? I just looked up my phone bill and realized that the $24.99 unlimited service plan I have is not adequate for me any more given all the recent advancements in wireless data communication and subsequent increased cell phone use. I get my service via 8x8 (former Packet8), a VOIP telephony company that picked up many of the SunRocket’s customers (myself included) after the company went bankrupt in 2007. Even back then $24.99 wasn’t such a bargain and now considering this is what Vonage (a heavy lifer in VOIP world) charges for unlimited service, one can surely find a better deal, especially if they are willing to give up the ‘unlimited’ part of it. At least this is the kind of assumption I made before I went on my bounty hunt last week. A couple of days later and I am happy to report that my assumption was correct and so far it looks like I will be switching my service. First of all, I use my cell phone more than I use my home phone these days. My home number is sort of a legacy I am carrying with me. At one point I even considered abandoning my phone number altogether but it turned out no so easy to do. Too many people and businesses have it and to make things worse some businesses still require a registered home number for verification purposes and so terminating it would be a disaster. Either way I am not ready yet to take on the challenge. Second, companies like Vonage and Packet8 take you by convenience. They will send a pre-configured phone adapter and absorb the equipment expense just to get you on the hook. If you have a bit of a DIY skill you can save yourself some $$ by taking the initial hit (and by exploring some less known providers). Can you do it? If you ever configured a wireless router yourself and you felt comfortable doing so then the answer is ‘yes’ because the skill set required from you is not much different. Here is my plan so far and I know it works because one of my friends went this route. Buy a VOIP Ethernet adapter (e.g. this Linksys 2102) and sign up for a Pay Per Call account at CallCentric. There is no setup or monthly fee (except $1.50 charge for 911 service). All I will be paying is 1.98 cent per minute for US domestic calls and very competitive international rates (9.35 cent per minute to Ukraine). This will give me plenty of time to test the service quality before I make the final step. Transfer my current phone number to CallCentric and will start receiving phone calls as well ($1.95 per month extra if you use Pay per Minute plan). Comparing this to what I currently have, $24.99 will last me over 1000 minutes per month and if I talk less (which is the exactly my case) then I will save $$. What do you think? Will this work? Any details I am missing? Any alternative providers to consider? There is an open question I need to clarify - will two VOIP adapters (the new for CallCentric and the old I have from 8x8) work on the same network while I test the service.